The Clubhouse at Southern Village Club is available at very reasonable rates. Our naturally lit space with hardwood floors offers flexible scheduling for your party or business function. 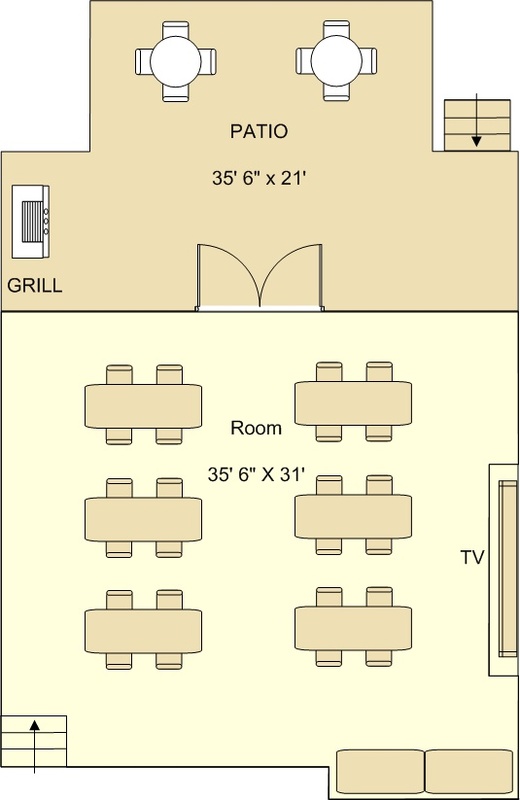 Shown is a sample club room setup, with room measurements. If you would like to rent space, please check the calendar to see if the time is available. The maximum number of people permitted in space is 60. Dates are only secured once payment is received. Club members may rent space or sponsor non-member rentals. You must include set-up and clean-up time in your rental. A damage deposit of $150 must be included with your rental payment, and will be returned to you if there is no damage to Club property resulting from the event. Renters are welcome to bring their own catering / food / beverage. Payment must be received at the time of reservation through Acuity Scheduling. Reservation is not final until payment is made. The room must be left in the condition it was found; all trash should be picked up and disposed of in dumpster outside, furniture returned to its original place, and floor swept and dry mopped (broom and mop in room). All functions must be completed by 10:00 pm. There is an optional cleaning fee of $75 if you prefer the Club to clean up after your event, or if room is not cleaned to the above specifications.